One points, while one listens. A couple go for a walk. 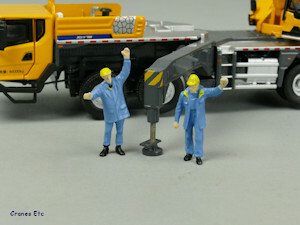 This is a set of mechanics figures intended to go with various construction equipment. The model comes in an unbranded box and inside the figures are contained between a pair of plastic formers. There is no model number or maker's name on the box. The figures are made of resin and appear to be hand painted. 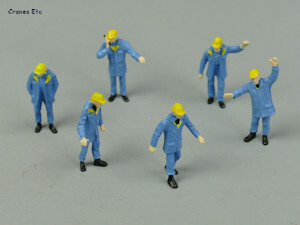 They are in a series of familiar poses for construction figures. 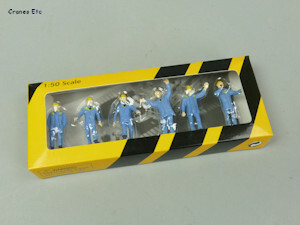 However they are not painted with high visibility clothing so will not look correct in dioramas. They stand and so are well balanced. The quality is reasonable and they are very good value. 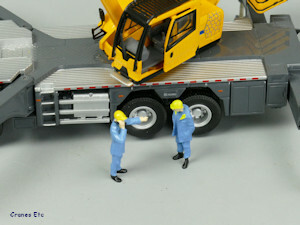 These are an inexpensive alternative to other construction model figures, and they pose well with suitable models. However a downside is they do not have high visibility clothing which restricts their use somewhat.